Facebook once again changes the look - Do you LIKE it? Home » TECH NEWS » Facebook once again changes the look – Do you LIKE it? Facebook once again changes the look – Do you LIKE it? Already one year is expected significantly redesigned version of the most popular social network in the world – but it was seen by only a handful of people. After initial comments and many months of testing, Facebook completely abandoned redesigning. However, news feed is still got some kind of refreshment. The company wanted to combine the design of Facebook’s interface familiar from mobile version with the one that exists on standard Internet browsers, outside the world of applications. As it says in the official newsletter of the company, people liked the ability to view large photos on the news feed, but the navigation was difficult. 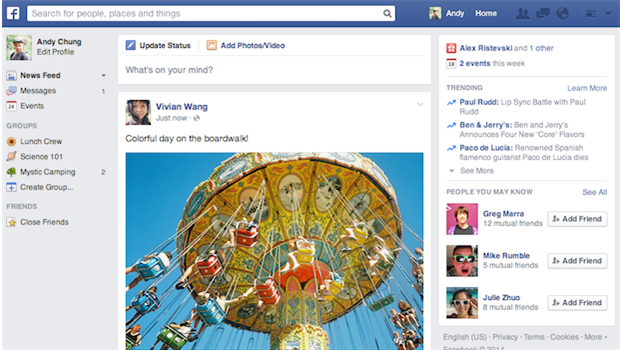 This new, final (for now) redesign of the Facebook are considered to have successfully combined both worlds. Facebook has chosen a new font, the images on the news feed are larger and the whole design is characterized by a smaller frames and borders, in short – a cleaner and clearer. It remains to be seen how it will look ‘in operation’, and company unlike last year, guarantees that the new design will appears to everyone over the next few weeks.